Drawings by Henry Wetherbee Henshaw of perforated stone artifacts (aka ritual staffs or sun sticks) recovered in 1884 from Bowers Cave in Hasley Canyon/Castaic Junction, used to illustrate Henshaw's 1887 paper, "Perforated Stones from California," published in pamphlet form by the Government Printing Office for the Smithsonian Institution. Henshaw (March 3, 1850 – August 1, 1930) was an ornithologist and naturalist who participated in several expeditions throughout the American West in the 1870s, collecting various types of specimens for the Smithsonian. 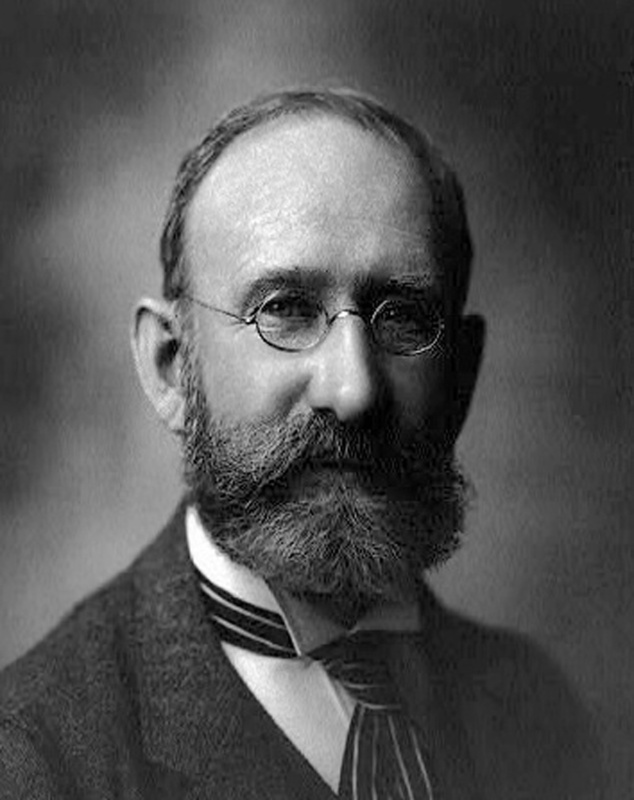 He was one of the founders of the National Geographic Society in 1888; in 1910 he was appointed head of the U.S. Biological Survey, a predecessor agency to the U.S. Fish & Wildlife Service. Retiring in 1916, he lived in Washington, D.C., and never married. Appearing below is the relevant excerpt from Henshaw's 1887 paper, where he describes the perforated stone artifacts from Bowers Cave in detail and interprets their purpose. Washington, D.C. | Government Printing Office 1887. In connection with the subject of ceremonial stones, attention may be drawn at this point to four unique specimens discovered by Dr. Stephen Bowers in a cave in the San Martin Mountains, Los Angeles County, California, and described in Pacific Science Monthly, June, 1885. They are unique because they are the only perforated stones thus far found in the United States which are attached to handles. These specimens have been added to the collection of the Peabody Museum, and three of them are now before me for examination, through the courtesy of Professor Putnam, who has kindly permitted them to be figured for use in the present paper. As the accompanying figures (Figs. 14, 15, and 16) afford an excellent idea of their peculiarities, a brief description will suffice. The disks are of a kind frequently found in California, and, in themselves, are not especially noteworthy. 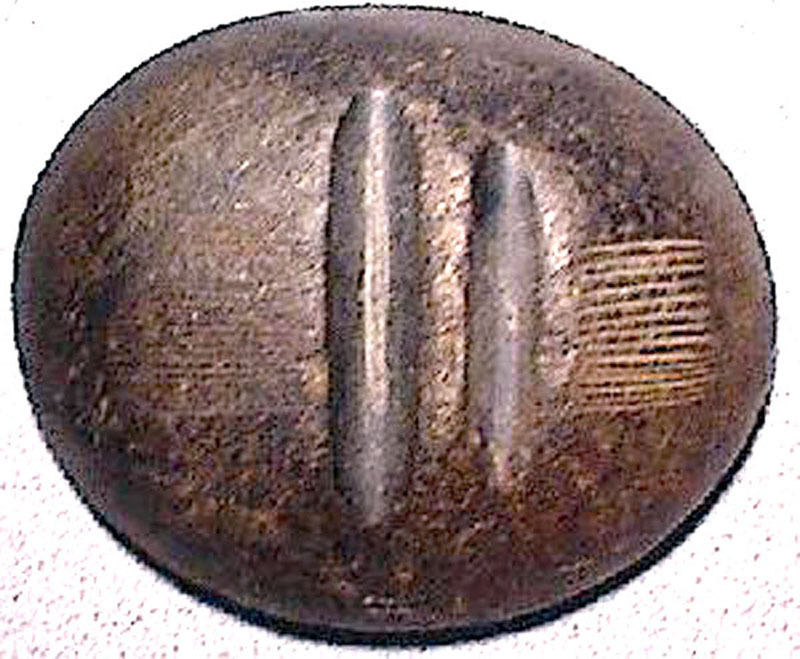 They are made of moderately hard stone, from 4¼ to 5½ inches in diameter. The holes were probably made by first being pecked from either side and subsequently drilled, and, as is frequently the case, are made smaller at the center, presenting somewhat the shape of a double cone. All three of the stones retain plain traces of paint markings, which, as will be seen in the illustrations, are disposed in regular patterns. It is to be noticed that the edges of the stones are smooth and show no evidences of abrasion by blows or other rough usage, a fact not at all agreeing with the idea that they served for hammers of any kind. The handles are from 15 to 18 inches long, and are made apparently of rather tough wood. All three are natural branches, dressed only to the extent of removing the bark and paring off the twigs, so that the natural inequalities of the wood, the knots, &c., are plainly visible. They are smooth as though from the friction of much use. The handle of one (Fig. 16) is marked transversely by a series of cuts, disposed for the most part in regular rows, and presenting the appearance of tallies. 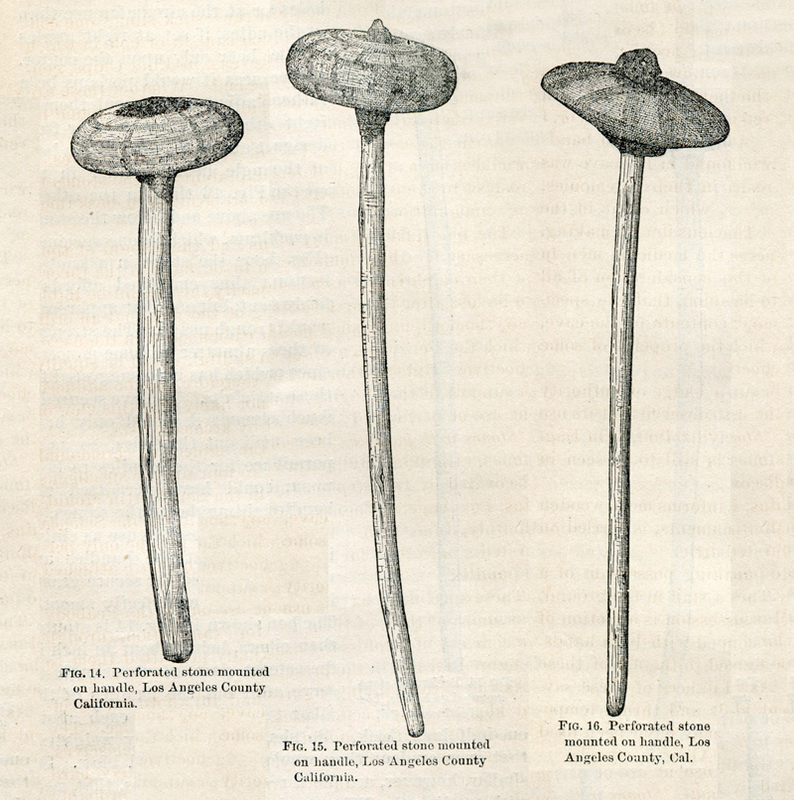 A most interesting feature of these specimens is the method by which the heads are fastened to the handles, which is done by asphaltum, a mineral which abounds in many localities of Southern California and was much used by Indians for fastening, mending, &c. The sticks are thrust through the stones so as to project slightly beyond, and as the holes are much larger at the circumference than at the center, the handles, if set at right angles to the stone, would bear only upon the center. Under the circumstances it would perhaps be a rather nice matter to adjust and cement them at right angles; and, either from accident or from design, they are set at an acute angle to the base of the stones, the angle being greater in the specimen shown in Feb. 16 than in the others. The unoccupied space above and below the stones is packed with asphaltum, which in one specimen (Fig. 16) projects above the stone in a knot or button. The cement thus employed affords a fairly strong attachment, but one that apparently would not stand very rough usage. The strength of the attachments is a matter of some moment, since one of the uses which has been suggested for these implements is as clubs. To have secured a much stronger attachment it would only have been necessary to drill out the holes, so as to permit a larger surface for the handles to bear upon, which, too, would have permitted the handles to be set at right angles to the stones. In connection with their possible use as clubs, it should be mentioned that the handles are neither roughened nor knobbed for secure grasping, but, on the contrary, are perfectly smooth. The handle of the one shown in Fig. 14 is stouter than either of the others, being about an inch in diameter at its largest part, stout enough to serve as a club handle; but the handles of the other two are much smaller, being each about one-half inch thick. So slender are they, and so heavily weighted, that it is evident they would be broken at a single hard blow. So similar, however, are the three in general form and features, that, notwithstanding the difference in the size of handles, it cannot be doubted that they were designed to fulfill the same function, and that what one is all are. After careful consideration of these implements I am convinced that their peculiarities accord best with the idea that they were the property of medicine men or conjurers, probably used in dances or superstitious ceremonies, as rain making, curing the sick, &c., this being the alternative suggested by Dr. Bowers. Not only does the character of the implements themselves agree best with this idea, but it is borne out also by the rest of the cave contents. The rudely painted notched sticks, the feather headdresses, and the bone whistles are all strongly suggestive of "medicine practices." Notched sticks similar to the ones found in the cave by Dr. Bowers are used in certain sacrifices by the Navajo, as Dr. W. Matthews informs me, and also disks of stone; the latter, however, are not perforated. Moreover, I was informed by an Indian in Santa Barbara County that feather bands or gorgets, of which a specimen similar to those found in the cave was shown me, were worn by all their medicine men in their ceremonies, and that the feathers of the red shafted flicker, which occur in the specimens found in the cave, were peculiarly efficacious in rain making. I was also told that bone whistles were used by the medicine men in their invocations. As already stated, therefore, a consideration of all the above facts justifies the conclusion, in my opinion, that the specimens in question, together with the rest of the contents of the cave, were the implements of trade of medicine men or the property of some religious order. 1. Bowers didn’t discover the artifacts in a cave; he purchased them from a local rancher’s son who discovered them in a cave. But Bowers wrote that he examined the cave (which he probably did), and he took credit for discovering them (which he also did, if only in a scientific context). See Van Valkenburgh 1952. 2. Frederic W. Putnam, curator of the Peabody Museum of American Archaeology and Ethnology at Harvard University. 3. An ornamental collar worn about the neck, like the iridescent feathers on the throats of certain male hummingbirds. LW2447: 9600 dpi jpeg from first-edition (1887) pamphlet.